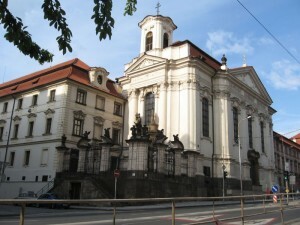 This week finds me in Prague and in the company of friends—some of whom are World War II buffs. The beautiful old city is dominated by its castle, which was once home to the kings of Bohemia and still lodges the Czech crown jewels. During World War II, the castle was taken over by the German army of occupation and became the headquarters of SS-Obergruppenfuehrer Reinhard Heydrich, Reichsprotektor of Bohemia and Moravia. This year is the 70th anniversary of his assassination. 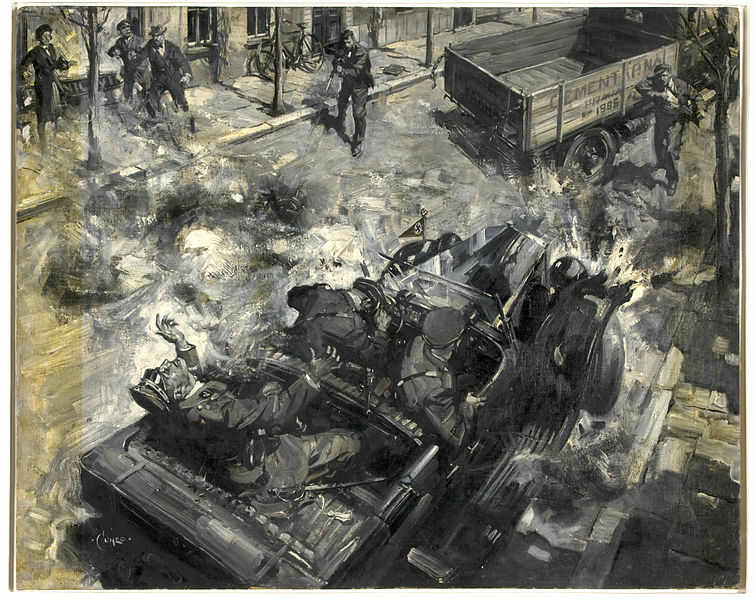 The above artist’s impression of the 1942 ambushing of Heydrich’s Mercedes has just been made available through Wikimedia UK, and comes from the British National Archives war art collection. Maybe Heydrich should have stayed out of the castle and left the royal jewels well alone. It’s believed he tried on the crown for size—and legend has it that usurpers are doomed to die with the year. The legend proved true, at least for Heydrich. Two Czechoslovak patriots—Jozef Gabcik and Jan Kubis—were trained by Britain’s Special Operations Executive (SOE) and parachuted into Czechoslovakia with a view to monitoring Heydrich’s movements and then killing him. They were accompanied by several other soldiers from the Czechoslovak army-in-exile that was based in Britain. On 27 May 1942, Gabcik and Kubis intercepted Heydrich’s Mercedes on the Obergruppenfuehrer’s daily commute to the castle. Heydrich ordered his driver to stop the car, and there was an exchange of gunfire. 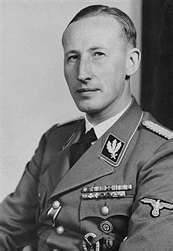 Heydrich received a shrapnel wound from a grenade but, even so, he opened fire with his pistol and leapt out to chase the fleeing assailants. The wound was more serious than anyone had realized. Despite the efforts of some of Europe’s top surgeons, he succumbed to blood-poisoning several days later. The brutality of the Nazi reprisals is well known: complete destruction of the villages of Lidice and Lezaky and murder or deportation of the inhabitants. Several thousand people were to die in total. Earlier this year, a monument was unveiled in the courtyard of the St. Cyril & St. Methodius Cathedral to honour the patriots who gave their lives. It was there, in the cathedral, that Gabcik, Kubis, and the others took refuge. SS troops besieged the building and, one by one, the defenders perished—some in the fighting and some by their own hand, to avoid capture. Bishop Gorazd and his priests were accused of complicity and were executed by firing squad. With typical Third Reich efficiency, the Gestapo sought out Jan Kubis’s girlfriend. She was deported, and died in the Mauthausen-Gusen concentration camp. This entry was posted in Milestones, World War II and tagged Heydrich, Jan Kubis, Jozef Gabcik, Prague, SOE, Special Operations Executive. Bookmark the permalink.